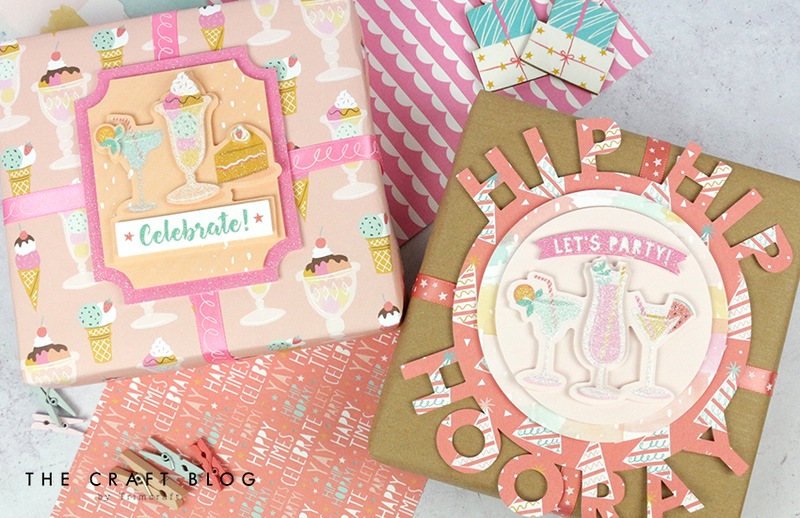 Get inspired to make your own DIY gift wrap toppers and create your own cute and crafty packaging for presents using the wonderful Dovecraft Make a Wish collection. Today Kathy is going to show you how to raise your gift-giving game with these DIY topper ideas. Made using the Make a Wish decoupage pad, these super quick, yet very effective ideas will make a one-of-a-kind topper for the present that you’ve spent ages lovingly making or picking out. Each Make a Wish decoupage pad has eight different designs that are perfect for any celebration! Get creative with your gift wrapping and find out just how much these decoupage designs can really transform your presents. You can discover the full Make a Wish collection here. 1. Begin by wrapping your present in your chosen paper (we used brown parcel paper here but you could use some of the Make a Wish sheets!) and securing some of the colourful Make a Wish ribbon around it. We used double-sided tape for a super neat finish. 2. Cut out your design using your Cricut Machine onto a sheet of the fun Make a Wish papers. If you have a Cricut machine, you can find Kathy’s template here! 3. Adhere your paper design to the top of your present. You could use foam tape or pads for this to add extra dimension. 4. Pick and build your chosen decoupage design from the Make a Wish decoupage pad using foam pads to add lots of dimension to your chosen design. 5. Adhere your decoupage design to the centre of your cut out design. Your present is now ready to gift! Your family and friends won't believe that you created this super cool topper. As well as an amazing decoupage pad, this Dovecraft collection comes with SO many elements that will help you to give your gift that extra something! Why not add the mini bunting and twine to your makes as a contemporary alternative to ribbon? Kathy also created this super cool shaker-style gift wrap! Simply wrap your presents in plain paper before adding embellishments from the collection between clear plastic wrapping. These really do add a whole new dimension to DIY gift wrap and the accessories that have been used inside the paper can be used again! What do you think to these DIY gift wrap ideas? Will you be trying them? If you do, don’t forget to show us by using #Trimcraft when sharing on social media and to upload your makes to the Inspiration area!